Our Portable Hand Held Magnetic Plate Lifter has a length of 158mm, a width of 147mm and a height of 25mm. This unit has a rated pull force of 30 Kgs and uses a simple lever system to engage or disengage the magnetic hold. For businesses looking for a way of using the power of a lifting magnet in a portable form then look no further. 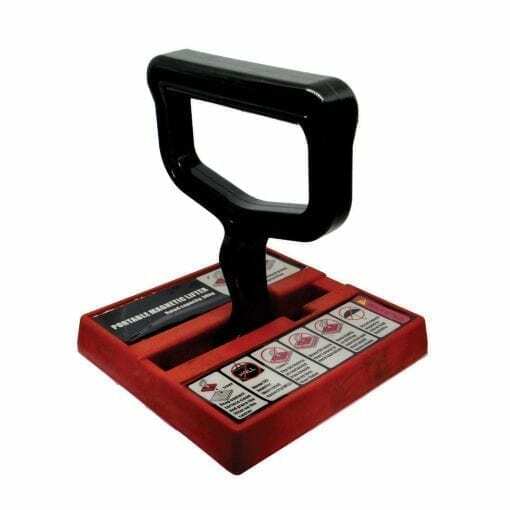 You will find our Portable Hand Held Magnetic Plate Lifter is the solution you are looking for! Designed to be a portable solution to moving ferrous material in a safe and easy manner. By using the simple yet effective leaver you can apply to a ferrous surface and move the material around the warehouse and once you are ready to let go simply push down on the lever. Quick easy and best of all a safe solution. If you are in a situation where a stronger pull is required to try our Superlifter’s! These are designed for use where above all safety is paramount with their 3:1 safety factor. Head on over and take a look at what we have!